Here we have Exeter City 66, a Leyland Tiger TS8 with Cravens B32R body and dates from 1938. 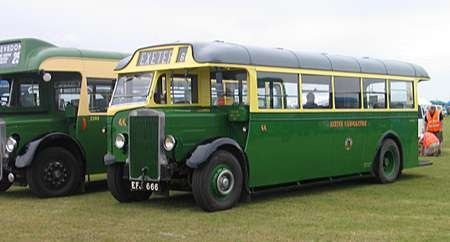 It is owned by Colin Shears and is part of the West of England Transport Collection based at Winkleigh in North Devon. 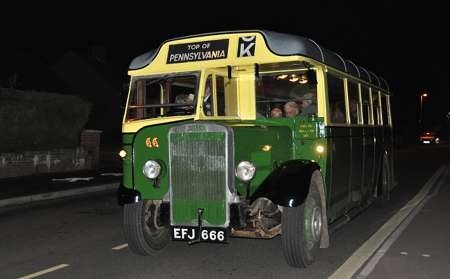 Here it is seen in the late evening working a run to the Top of Pennsylvania during the Exeter nocturnal event on 13 /11 2011. I realise there are already pictures of this vehicle on the site but I thought the night shot was a little different. The next Winkleigh open day is Sunday 6th October 2013 and the next Exeter Twilight event is Sunday 10th November 2013. A beautiful photo indeed Ken, and the bus stands out bright and clear in the night sky – quite an exceptionally professional exposure I think. On seeing the destination display I couldn’t help being reminded of some other famous buses – in very similar Southdown hues – which carried us to "97 Top of Beachy Head." The destination Pensilvania reminded me when staying with my aunt and uncle in the village of Staincross to the north of Barnsley, there was a district called California. Are you familiar with this area Chris? Not sure, but I might have been down this road before – Lincolnshire Road Car used to serve Jericho, Jerusalem and New York, amongst other quaintly-named, and even more quaintly-pronounced places! Photography of the highest standard.Ken never fails on subject and quality. Here is the same wonderful machine in daylight at South Cerney in 2011. Very rare to se open platform single-deckers at shows. This one was a treat to see and hear. There’s also a Jericho in Bury and Rhodesia near Worksop. 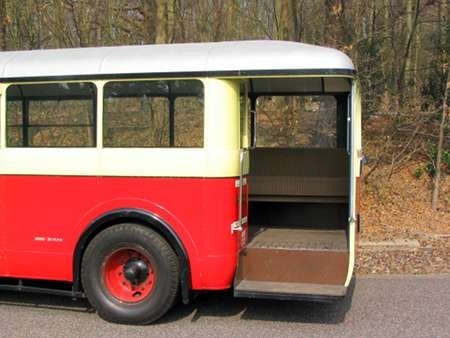 "I’d say that preserved rear-platform single deckers are rare period. Here’s a photo I took of LGOC T31/UU 6646. at Cobham 2007, showing the rear platform in all its glory. Interesting that the rear offside seat went all the way to the rear of the vehicle. Was this common on all such vehicles?" A ten minute walk down the road Geoff and you’ll find First has a farestage on the T6/T8 Mankinholes Circular called ‘California’. Could someone tell me what were the oblong tanks for, below the N/S/F windows please? That looks to me like an Autovac, which was in simple terms a header tank for the fuel. I’ve not had much involvement with it but I think it was a system that used induction vacuum to pull air up from the tank. By having a reservoir it ensured that some fuel was available to start the engine. The alternative method of getting fuel up from the tank was the lift pump which was usually on the side of the injection pump. In answer to Andy Fisher, the tank is an Autovac, which draws fuel up from the tank and supplies it as needed to the fuel injection pump. I always feel that a visible Autovac adds something to the look of a bus. No problem Andy – the little tanks are for for the "Autovac" fuel lift system and for some reason, even in my infancy, they fascinated me and caused me to view any vehicle without one as "lacking in style." Of course in those early days I had no idea what they were for !! As can be seen in the photo, the Autovac caused little forward distraction to front seat passengers on the Exeter Leyland, but on the Bristol/ECW it is more visible from within – no detriment of course to the superb Bristol vehicles. One other preserved rear entrance open platform saloon is an Edinburgh Guy Arab III with MCW bodywork. For some of its life it was a driver trainer and had the offside bulkhead window removed. A ride on this proved perhaps the noisiest ride on a bus I’ve ever had! Five cylinder Gardners and Halifax hills don’t mix! There is a link here to another Craven bodied single decker, but this one is a Karrier built for the LMS and operating on the road in Stratford upon Avon but it then went by rail to Blissworth. Used in the final 10 minutes of the film ‘The Remains of the Day’ 1993, where Anthony Hopkins and Emma Thompson say their farewell…..Sorry if someone else has already listed this.